During the valuation of a company or enterprise, the estimation of the Terminal Value of the company is an important aspect that should not be forgotten. 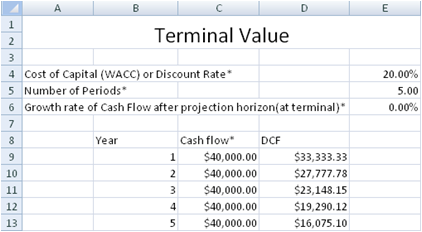 There are several ways of estimating the terminal value. This Terminal Value spreadsheet model uses one of the most commonly used formula for estimating this value. CF - Cash Flow at the end of the projection horizon. Cash Flow in Year 5 of the spreadsheet model. G - Growth Rate of Cash Flow after projection horizon. This is typically a constant value or zero. 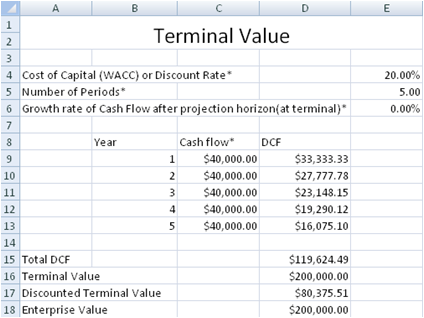 This spreadsheet also provides a complete model for valuing the company (enterprise) by summing the Discounted Terminal Value and the Discounted Cash Flow of the company in a 5 year time frame.